In 2014 the Foreign Language Press in China published "The Governance Of China", a volume of articles and speeches by the Communist Party of China (CPC) General Secretary, Xi Jinping. The volume contains many interesting articles which, if words always translated in to deeds reflecting them, would see China would still as a great hope for the oppressed peoples of world as it was at the dawn of the 1949 revolution and during Mao Zedong’s period of leadership. * rely on the working class to build socialism to realize the "Chinese dream"
Implied in this particular speech of Xi Jinping is that the working class is still the leading class in China, although Xi Jinping uses the term "main force" which made me curious why he did not say "leading class". Even capitalists know that the working class is "the main force", just as long as the working class "knows its place" and follows what the capitalist class and its governments and state machines tell it to do. So to investigate further I read a book by University of Sydney social science professor, David Goodman called Class In Contemporary China. This book is an extremely useful resource for anyone who wants to find out which class rules in China and find out about the class structure within contemporary China. The Ruling Class - Who Are They? 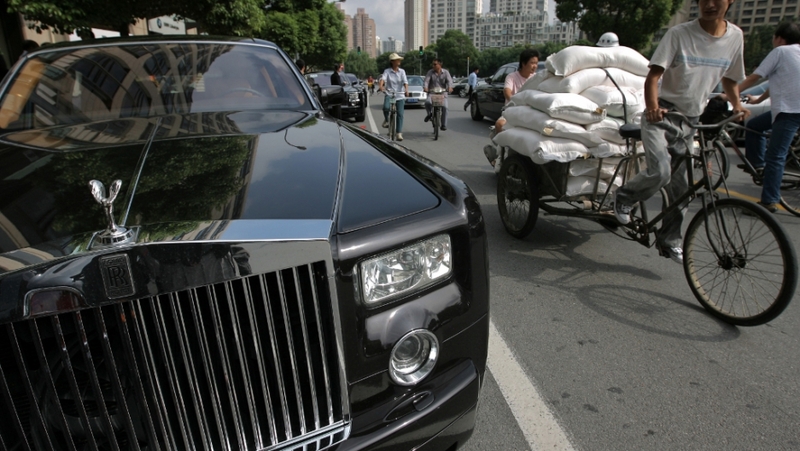 Goodman provides ample evidence that the dominant ruling class in China today is what he calls a "cadre-capitalist class" which consists of an interconnecting web of CPC leading cadres and entrepreneurs in both the State Owned Enterprises and rapidly growing private economic sector. Goodman summarizes this interconnecting network in the following way: "...Quite explicitly, that cadres have become embourgeoised and that capitalists have been politicized". Goodman's research showed that in 2012 the educational level of the leading cadres in these positions was generally high with for example 74% of members of the Standing Committee of provincial level Party Committees having Masters Degrees and 22% having Doctorates. Goodman concludes that "there can be no doubt that education has become a necessary condition for entry to the political elite", notwithstanding differences across regions. Interconnected to the "embourgeoised" cadres is a hierarchy of extremely wealthy capitalists across SOEs, many of whom have private shareholders and the "marketized" private sector. Goodman says that in 2013 there were 212 billionaires in China with each having wealth of US$1,000 million and 1,020,000 millionaires. The growth of a billionaire and millionaire class accelerated in the mid-1990s according to Goodman's research, with the restructuring of SOEs and expansion of the private sector including increased foreign investment in China and foreign investment by Chinese corporations. Foreign investment in China first started as predominantly joint ventures and then included wholly owned companies. The link between the leading cadres and capitalists has grown as reflected by changes in emphasis and priorities expressed in National Congress Resolutions. In the 1980s private business was described as a "necessary and beneficial supplement to the public economy". At the 15th Congress in 1997 the private sector became "an important component". At the 17th National Congress in 2007, the Party Resolution pledged itself to "unswervingly encourage, support and guide the development of the non-public sector." At the Third Plenum of the 18th Central Committee of the Party in November 2013, it was resolved that "both public and non-public sectors of the economy are important components of the socialist market economy and significant bases for economic and social development". All this change in emphasis created the conditions according to Goodman for a stronger connection between leading cadres at all levels and private sector capitalists which also gave rise to more overt forms of corruption by high-up leading cadres which the leadership of the Party was forced to at least appear to be doing something about. Has The Growth Of The Cadre Capitalist Class Benefited The Working Class? Goodman provides a breakdown of the different categories of workers and peasants listed above. The numbers are mind boggling, giving no doubt that on the international stage, the working class in China is a restless giant awaiting to explode. The better-off public sector workers in China's SOEs in 2011 numbered a staggering 67 million and 6 million more in urban collective enterprises. In 1978, state and collective sector employees constituted 99.8% of the urban workforce. In 2011 this had fallen to 20.3%! Between 1993 and 2006 up to 60 million workers in SOEs and collective enterprises were retrenched. The privatisation of SOEs gave rise to many struggles by public sector workers with their anger often expressed according to Goodman in terms of "betrayal of the working class" and SOEs practicing "class vengeance". The numbers of workers in the private sector in 2011 according to official government statistics was 123.4 million. Added to these were 153 million migrant workers from non-urban areas leaving the land in search of work and a better income. For all of these workers, especially the migrant workers, job insecurity, casualisation, low wages or no pay at all in some cases has given rise to tremendous struggles and also widen the power and wealth gap between the ruling class and the subordinate classes. Very few leading cadres come from the subordinate classes. So those in China most supportive of the existing political leadership are those who have got rich or better off at the expense of the 270 million or more workers in China in insecure employment and basically working in what is often called "the informal sector". Many people in countries like Australia believe that China equals cheap labour and threats to jobs here. The imperialist media portray this as the result of China being led by a one-party Communist Party state. This is designed to maintain the illusion that the two party parliamentary system of capitalism in most western countries is "democracy". So going back to Xi Jinping's "The Governance of China", comparing his talk about the working class being the main force and relying on them to build socialism, how does it stack up when clearly from Goodman's research, the blue collar working class is not the ruling class but one of the "subordinate classes"? If Xi Jinping in reality is a captive, willing or unwilling of the cadre-capitalist class, how much credence can be given to his statements about "Opening Wider To The Outside World", particularly one speech in The Governance of China where he says: "China does not subscribe to the outdated logic that a country will invariably seek hegemony when it gets strong. Peaceful development is the only alternative". Xi Jinping may genuinely believe this. However, if the Communist Party of China which he leads is driven by a capitalist class whose motivation is profit and capital accumulation and expansion, including overseas, what chance is there of peaceful development predominating? Only a revolutionary party where the working class is the leading class can ensure peaceful development.